Last friday morning me and Sophie started our trip towards Trier in Germany. This is a small but very old town by the Moselle river. Its' glorious days actually took place during the antiquity and I guess it today mostly lives on tourism. But it was a very nice city with a beautiful old town! In Trier we had a reunion with Tobias and Mikael. Tobias has been studying in Germany this autumn and was now heading back to Finland by train through the eastern Europe. And Mikael came here to accompany him back home. It felt so nice to meet friends from Finland again and being able to talk and laugh without being forced to explain a lot of details all the time. I think the atmosphere was actually very relaxed... and joyful too! Especially for us who's been abroad. There were hundreds of things to discuss and compare. We were wandering about in the city, visiting all the compulsory sights and just had a good time together. Unfortunately the weather was lousy during the whole trip so most of the pictures I'm going to post here will look very grey and boring, but you can try to imagine a blue sky and sunshine in stead :) You should know that I took almost 200 pictures during this week, so it's only a fraction of them you see here on my blog! 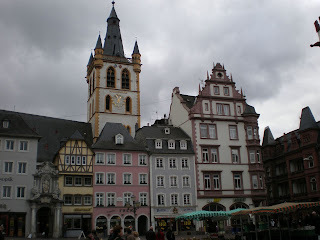 Here's a view from the old town square. I liked these colouful houses. Some of the houses were even decorated with coloured bricks forming a nice pattern. And here's one of the compulsory sight: a Roman bath! If I remember correctly, it's one of the largest in northern Europe. There were also an amphitheatre, a bridge and a city gate dating to the same period. We were also able to enter underneath the amphiteather and that was so cool! The atmosphere there was very mysterious! 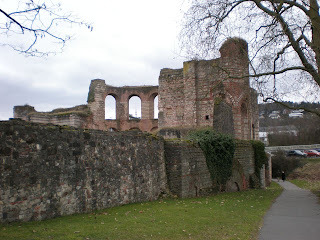 But back to Trier. Before the guys arrived, me and Sophie amused ourselves in the city museum of Trier. It was huge! 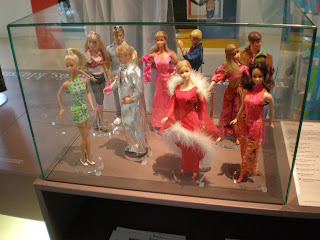 (It seem like all the museum over here are huge... at least compared to the museums in Finland!) 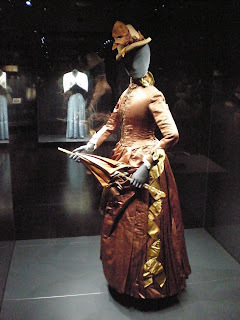 But although the history-part was interesting my favourites were the two fashion exhibitions. 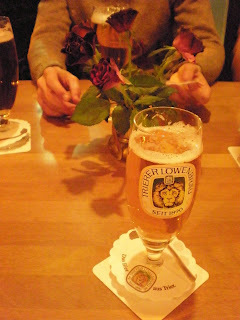 And well, since I was in Germany, I had to try a beer even though I usually don't like it. I tasted a beer from Trier (Trierer Löwebrau) and that wasn't all that bad. I was even able to finish my glass! ;) But then I changed back to wine again. The last thing we saw before we left the town was the Trier Cathedral. This cathedral is the host of the Holy Tunic, i.e. the robe that accordning to the tradition was worn by Jesus when he died. 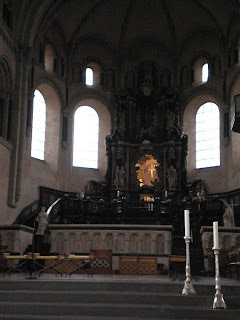 It doesn't look even half as good in the picture than in reality, but behind the altar there was a locked room where the robe was kept. And above the door, there was this huge, decorated hole in the wall and through that hole you were able to see a part of the room filled with golden things. And the gold made the whole room glow! And that is the first thing you see when you enter the church. Very impressing!